What role do the media play in wars and conflicts? Do the (horrifying) pictures have an impact on the viewer who is located far away from the conflict areas? These are questions that are not only posed generally in the global and the digitally connected world, but it becomes particularly relevant when considering war and conflict films. 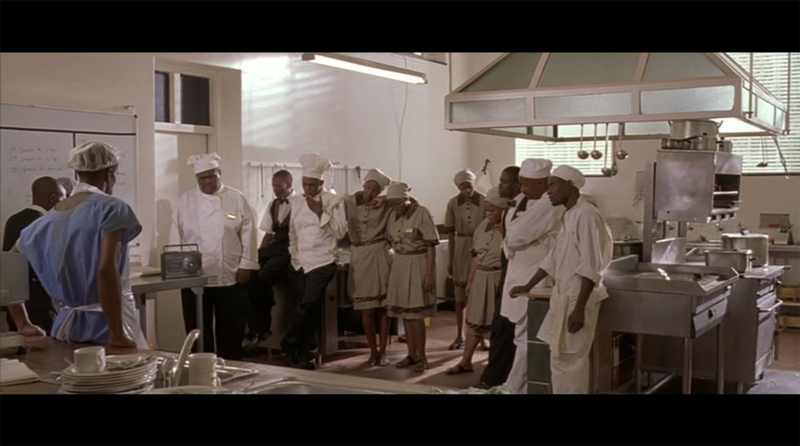 “I think if people see this footage, they’ll say ‘Oh, my God, that’s horrible.’ And then they’ll go on eating their dinners”, explains the camera man Jack Daglish (played by Joaquin Phoenix) in the Hollywood film Hotel Rwanda (Terry George, 2004). Jack is a Western war correspondent responsible for filming several horrifying images of the Rwandan genocide. His statement shows that he has lost any belief in the impact the footage he collected may have on the world. Susan Sontag notes in relation to the effects of war images that such attitudes seem to be widespread: When they are shown frequently, they will lose their relevance and the spectators will get emotionally dulled (cf. Sontag 2005). A completely different view is taken by the documentary film Silvered Water: Syria Self-Portrait (Ossama Mohammed, 2014). 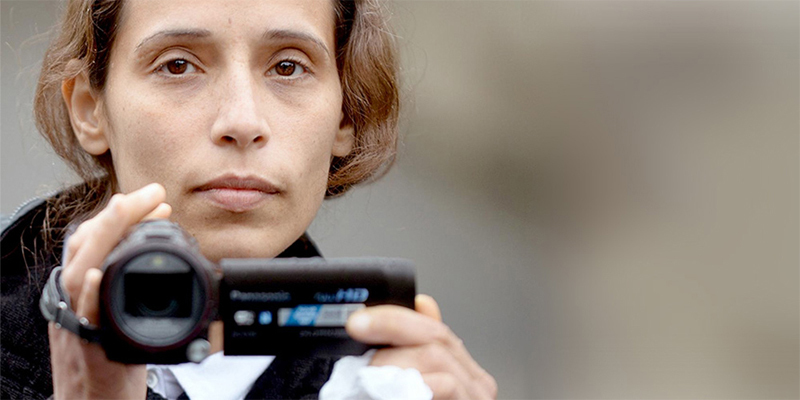 “The camera is a weapon” declares the co-directress of the film, Wiam Simav Bedirxan. She and other Syrians use their mobile phones to film the atrocities during the civil war, hoping that the publication of their videos via YouTube calls attention to their situation. The metaphor of the camera as weapon demonstrates a strong confidence in the image and its ability to provoke a reaction in the Western world. Consequently, a strong contrast becomes evident: On the one hand, there’s the Western cameraman in Rwanda who neither attaches much importance to his footage nor to its ability to shock the Western audience. On the other hand, there are the Syrian activists who believe in the force of their images and consider their video recordings as a chance to improve their situation. Despite these contrasting perspectives, the focus in both films on the media’s documenting responsibility seems to suggest it holds great potential. Both films seem to pose a series of key questions: Is the spectator’s complicity in events directly suggested by the presence and focus on the camera within conflict? Does the focus on media images become an instrument of the war film genre to generate awareness in a detached (Western) spectatorship? Thus the director characterises his film as an adaptation of a real event, whereas the documentary film Silvered Water refers to another truth claim. This film is about the civil war in Syria, the ongoing armed conflict between the governmental forces of President Bashar al-Assad and different oppositional groups. 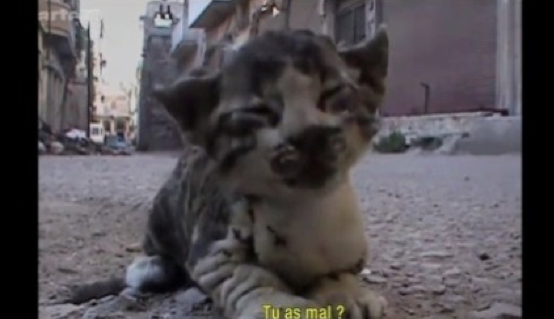 By and large, the film consists of video recordings co-director Wiam Simav Bedirxan and other Syrian amateur filmmakers throughout Syria took with their camera phones in the besieged city of Homs. It is however difficult to determine the temporal and the spatial axes of the film, while the fragmented action within the film and its wiggly shots have a discomforting effect on the viewer. As a result, the film is takes on an essayistic form. “It’s not about information, it’s a feeling, it’s suffering. 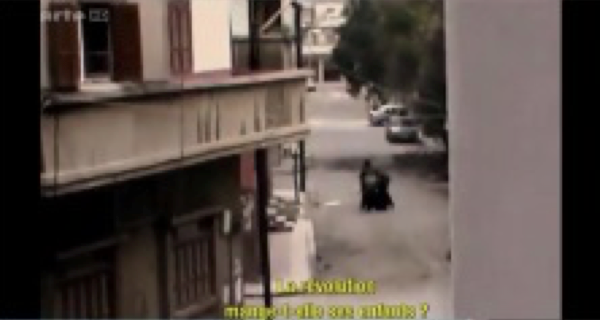 This is a distress call […] All of this you can see in each image.” explains the director Ossama Mohammed (2014: 1). 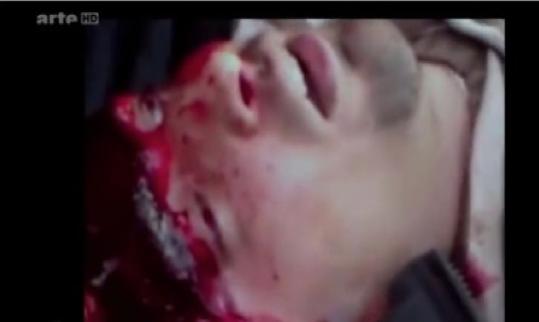 So the truth claim in this film relies on the real video recordings documenting a real conflict. Even though the truth claims of both films are based on differing elements, the fact that they both underline their truthfulness from the outset impact heavily on the expectations of the spectator: The films do not show a fictitious action, but real historical events, which makes awareness and real involvement on our part possible. But what role does the presence of the media play in this process? The topic of the media in both films is treated in contrasting ways. In Hotel Rwanda for instance, the cameraman Jack argues that he has lost his belief in the power of his images, whereas co-directress Simav has a strong confidence in the effect of her images underlines Silvered Water. These differing attitudes are not only connected to the type of media represented in the films, but they also comment on how the media is received and visually interpreted by viewers (in the West). 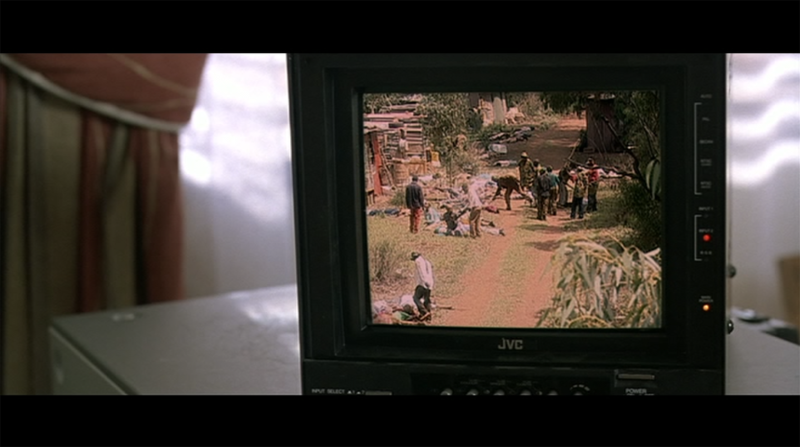 In Hotel Rwanda, the media is represented by Jack and his Western television crew, who are sent to Kigali to report on the unfolding unrest. 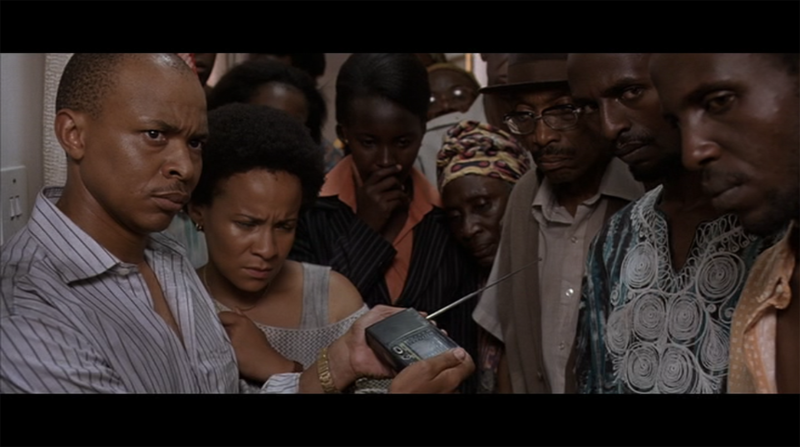 Additionally, the radio plays a key role in the film – particularly the radio station Radio Télévision Libre des Mille Collines (RTML), which was a crucial player in the unfolding of the real historical conflict. Similarly, Jack’s footage also played an important role in relation to the structural development of the film. The brutality of the conflict is initially, for example, almost exclusively narrated through the images Jack brings back to the hotel. They are thus often used to comment on the events. Especially fascinating is the construction of the above scenes in that they are defined by sound instead of image. 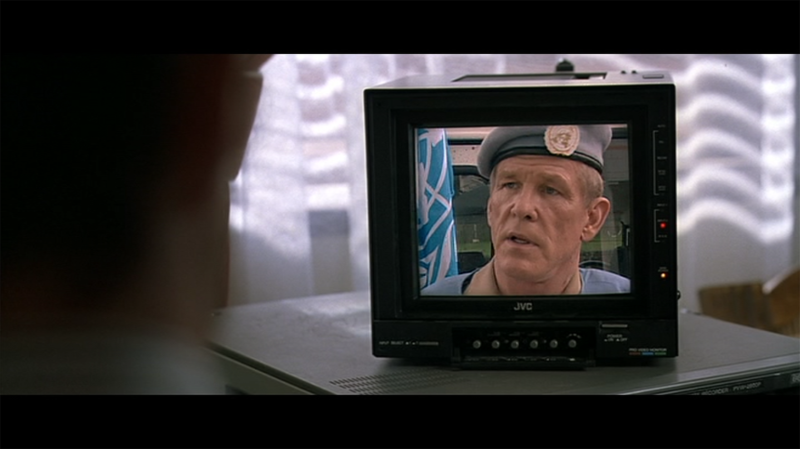 In addition to the scenes in which the film characters specifically listen to the radio, the pivotal scene in which they watch Jack’s footage, the action is rather transmitted aurally than visually. In fact, when Jack shows his video recording of a massacre, it is visually represented at great distance and on a small television screen. The affective content of the images is consequently very low. Jack’s scepticism about the actual force of his images is visually translated through this distance, which seems to renounce an explicit presentation of shocking images. In Silvered Water on the other hand, Simav’s confidence in her video shots is reflected in the visualisation in the form of many shocking images. Given the fact that Western war correspondents are not allowed into Syria and the national press is strictly censored, the media and its role in the conflict is represented though the video recordings taken by Syrians with their camera phones. From this it follows that the film is not about the public press, but rather about individual experiences as well as the functionality of online distribution. This produces a completely different aesthetic: dead bodies at close range, bombed cities and explosions creating a quasi subjective perspective of spontaneity and non-specialism. 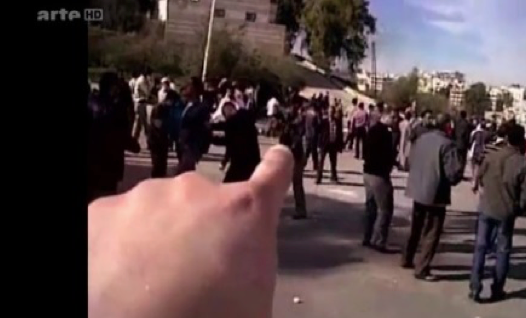 The amateur filmmakers relentlessly film the events and often endanger themselves. As a result, they produce images with a high affective intensity that has a great potential to shock the (Western) spectator. The function of the media and the visualisation of media images are therefore completely different in the two films, which leaves one to ask what impact these contrasting methods of representation have on viewers. 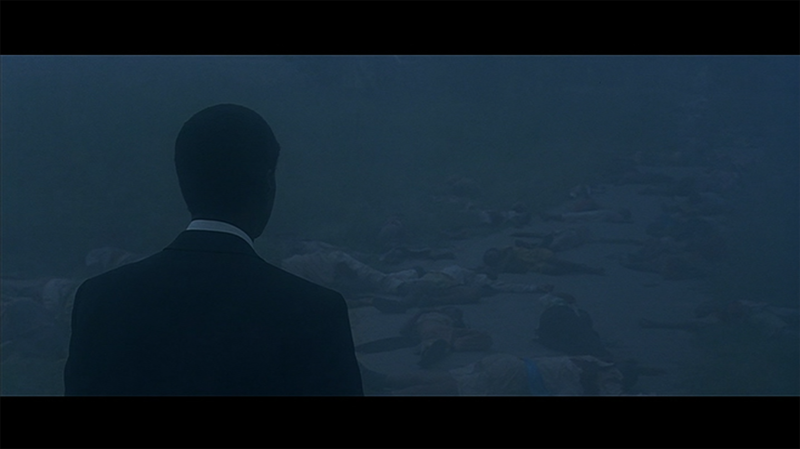 Let us first examine the absence of shocking images in Hotel Rwanda. Due to the fact that the extent of the visual information presented to us in these scenes is actually quite low, the auditive level comes to the fore more forcefully. Similar to the film characters themselves, the viewer also has to listen to the news reports. What is more, as a result of the film’s truth claim, we understand the film to be an adaptation of a real historical event. This is how the cinematic news reports are transformed into ‘factual’ reports for us. We listen to them with the characters, while simultaneously interpreting them in our reality as actual facts about a historical event. This effect of being simultaneously inside and outside the diegetic world emerges in the statement by Jack quoted above. Due to his empathic behaviour and his wish to understand not only the horrible situation but also the complexity of the whole conflict, Jack represents an empathetic Western spectatorship able to identify with the situation through images. But this identification quickly disappears when he says: “I think if people see this footage, they’ll say ‘Oh, my God, that’s horrible.’ And then they’ll go on eating their dinners.” This statement reveals to us the true nature of our brief identification. It is not the empathetic yet critical Jack with whom we can identify, but with the non-sensitive Western viewer who can only spare a brief moment of empathy to these shocking images. The narrative is briefly interrupted insofar as that we are addressed directly in our role as a distant recipient of these images and a real citizen of the Western world. In this way, a certain responsibility which can extend beyond the film is generated. In Silvered Water one can notice completely different formal and narrative strategies designed to create a sense of responsibility through reflecting on the close impact of the conflict. 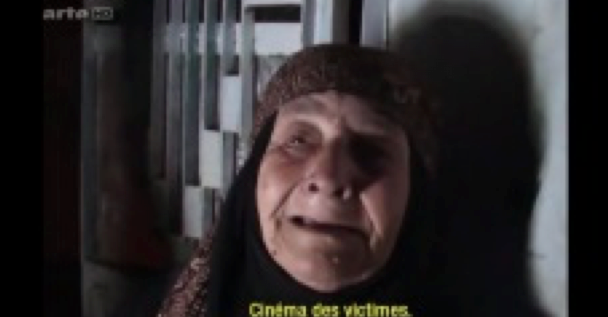 As already mentioned with reference to Simav’s metaphor of the camera as a weapon, in this film the role of media images is represented mostly by the urge of the Syrians to provoke a reaction in the (Western) world with their videos. The truth claim relies on their YouTube-videos, which are produced by presenting the up-close-and-personal view of the Syrian situation to us. The outcome of this strategy is that we are the unsuspecting recipients of the shocking images. The whole time we are also placed in the position of witness, watching the ongoing atrocities unfold. In this case however, one may run the risk that productive identification with the events depicted may become impossible, since the affective intensity of the images could threaten to overwhelm us. Simav consequently created certain formal and narrative strategies in order to distance the viewer from the depicted atrocities thereby making reflection possible. 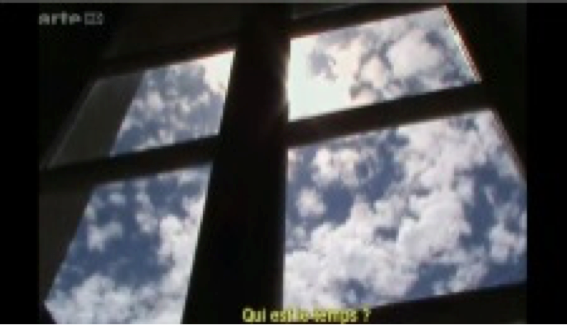 By intercutting video recordings of the director’s everyday life in Paris where he lives in exile, the shocking images in Syria are starkly contrasted by poetic pictures and use of language: Visually there are shots of clouds and rain drops, aurally there are emotional Arabic vocals and a voice-over that poses philosophical questions. Consistently, a meta-narration opens up new vistas about the terrible images, most notably for example by presenting the atrocities as a reflection of the windowpane of a subway in Paris. Mohammed does not leave the viewer alone with the anonymous and shocking videos, but he finds both visual and auditive ways to show his subjective relationship with the images while including the spectator in this process. In addition, there are intriguing instances when montages put the production and the evaluation of the images in question. 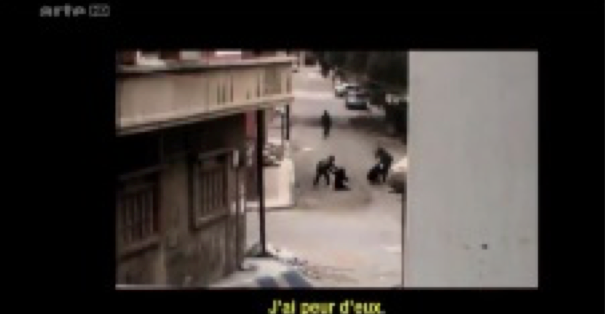 At first the “cinema of the murderers” is contrasted with the “cinema of the victims”, but shortly after the montage blurs this strict opposition by using the same scene in different contexts: Simav films two soldiers who seem to arrest two civilians. Initially, Simav comments: “I’m scared of them” and the spectator thus takes them for members of the Syrian army. When we see the scene a second time in the film, Simav says: “The insurgents could arrest me. Does the revolution eat its children?” and we understand that the scene presents Islamist revolutionaries. This use of montage therefore shows the viewer plainly that the images are susceptible to manipulation, which leads him or her to take a critical distance. Furthermore the viewer gets a sense of the complexity of the whole conflict. There is no longer a clear opposition between good and bad. The (peaceful) insurgency against the regime has now developed into a threat from two sides. The montage therefore not only finds ways of distancing the viewer from the shocking images, but it addresses us at the same time as the ‘spectator’ of the film and the ‘recipient’ of the (real) images so that we are requested to think about the real conflict, the role of the images and our own position in the world. This essay examined how the use of the camera and the media in both films has the potential to engage the (Western) viewer. It did so by focusing on the contrasting statements about the effects of war images by (a) the cameraman Jack in Hotel Rwanda and (b) the amateur filmmaker Wiam Simav Bedirxan in Silvered Water. It can be stated that in spite of evident contrasts concerning their genre, the visual and narrative conception and their stance towards the effect of war images, they nonetheless find different ways of addressing the viewer directly. In this way both films generate a reflection or a certain sense of complicity in conflict. Moreover, as a result of the various truth claims, the spectators expect a direct representation of a real event so that they receive the narrative information as viewers of a film, but also factual information as real persons. 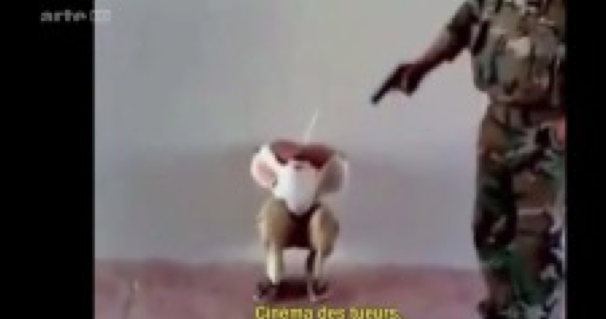 In the case of the film Hotel Rwanda the historical event of the genocide in Rwanda is not transmitted visually by shocking images, but primarily on an auditive level. From this it follows that the television and radio reports turn into factual reports despite being recreated within a narrative film. Jack’s statement about his images however draws our attention to the fact that reproduction causes images to lose their force. His words are thereby transformed into an accusation directed towards every viewer of the film. With the aid of media discourse in the film the narration is consistently interrupted so that we have no possibility to (over)identify with the film characters, but we are forced to reflect on our own culpability in the consumption of such images in our real lives. This effect of generating a sense of guilt is equally achieved by the film Silvered Water, albeit through completely different narrative strategies. Due to the great number of shocking images as well as the documentary’s explicit truth claims, the viewer needs to be distanced from the overwhelming nature of the horrors represented. With the use of Brechtian distancing strategies as well as a warning as to the pliability of war images, the film creates a powerful critical distance. The viewer is thus ultimately able to realise just how complex the Syrian conflict is. It can therefore be said that the importance of the media in wars and conflicts as well as the question whether (horrifying) images provoke compassion or not, starkly comes to the fore in the differences in handling the issue in films. This is also true for how media produced images are interpreted by the public. Just like the argument of this essay relies on my own impressions and my personal experience of watching the films, the supposed effects of (horrifying) images can only be experienced individually. If the camera serves as a weapon in wars, i.e. as a recording tool producing images that have a bearing on the conflict itself, it is impossible to present any straightforward answer to its role or effect. Nonetheless, the notion of the camera as a weapon can be pursued interestingly in metaphoric terms. If the media and the camera itself are directed specifically at the viewer, they become weapons – a weapon that is aimed at the viewer sand hits them so that they are affected by the conflict. This affective impact ‘wounds’ the viewer and thereby generates a sense of responsibility or a continuative reflection. Therefore making the media part of the subject of war films presents one with an exciting avenue of research that offers not only an interesting perspective connecting theoretical study with practical film production, but it also offers a wider context in which the media play an important part in the understanding of war and conflict. 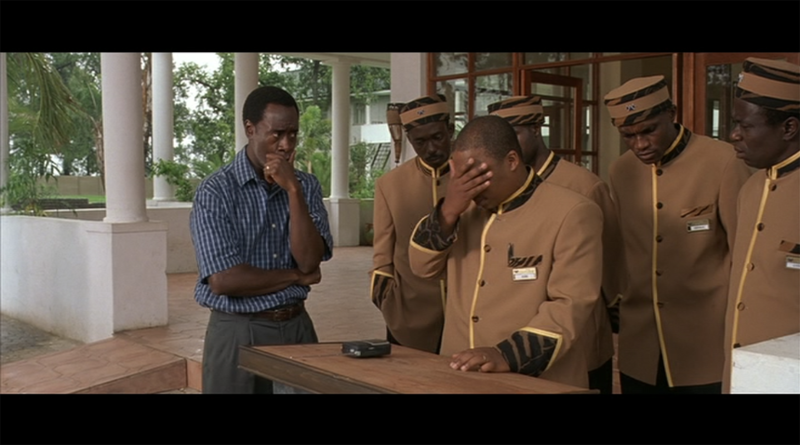 Gudehus, Christian/ Anderson, Stewart (2010): Understanding Hotel Rwanda: A reception study. in: Memory Studies, edition 3(4), London: Sage. p.344-363. Landsberg, Alison (2013): Politics and the Historical Film: Hotel Rwanda and the Form of Engagement, In: Rosenstone, Robert (ed. ): A Companion to the Historical Film, Malden, MA: Wiley-Blackwell. S.11-29. Mohammed, Ossama (25/05/2014): Regisseur Ossama Mohammed: Kriegsfilm aus der Ferne. SFR Kultur – Kulturplatz. [online available on: https://www.youtube.com/watch?v=hmEGQWq0UuM (07/07/2015). Sontag, Susan (2005): Das Leiden anderer betrachten. Frankfurt am Main: Fischer. George, Terry (Regie). 2005. Hotel Ruanda: Eine wahre Geschichte. DVD. München: Universal-Film. 118 min. Mohammed, Ossama/ Bedirxan, Wiam Simav (Regie). 2014. Eau argentée – Syrie autoportrait. ARTE. 15.09.2014, 23:45h, 92 min.